Saying that Google wants your website to be mobile responsive is an understatement. 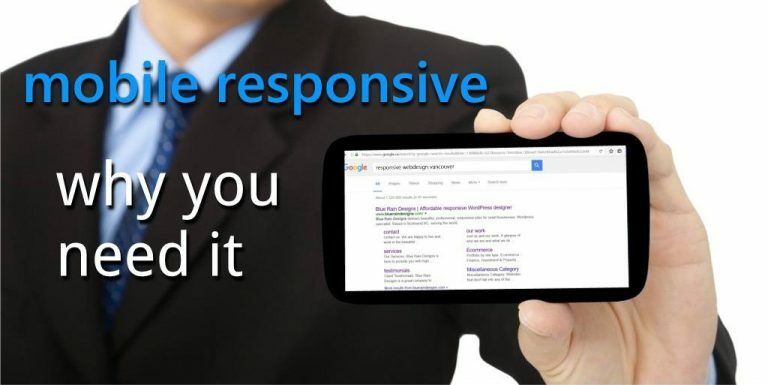 With over half of searches now being done on mobile devices, Google (and Bing) are making it pretty imperative that your website be mobile responsive. How are they pushing this change? Basically, they’ve changed how their searches work so when a search is done on a mobile device, sites that are mobile responsive push higher and those that aren’t will fall. In the simplest terms, it can reduce your traffic drastically. The reasons make sense, nobody likes looking at a website with text too small and that you need to slide your screen back and forth and expand and shrink it to look around the page. Responsive design solves that problem, letting your page shift and change to fit any screen size so all your viewers get a good experience. So no matter if they are on a smartphone or tablet, a laptop or desktop, they’ll always be able to get around your site easily and find what they want. It’s more important than it seems on the surface as well, since a higher percentage of mobile searches convert into customers contacting you, so losses in mobile searches are cost you more business. Your website is long term advertising, available 24/7, make sure it’s able to get your message to every viewer. We’ve said in the past that a bad website is as bad as no website, and that really applies to non-responsive sites nowadays. Whether getting a new site or a revamp of an existing site, mobile responsive is a must have.